The topic of VR + children is basically Marmite, either instantly eliciting excitement for opportunities to expand and amplify story experiences for children, whilst also raising alarms to proceed with caution. 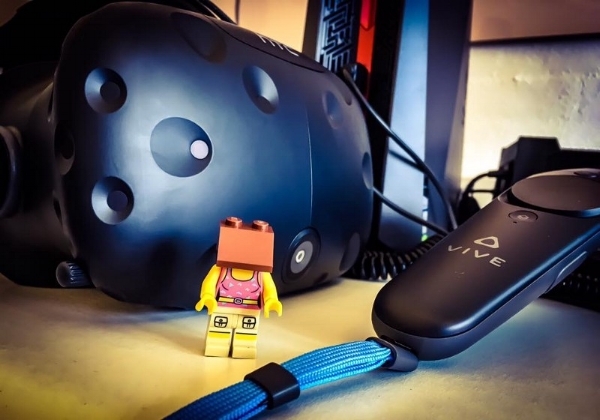 Concerns around experiences in VR for children include caution around cognitive and sensory overload, immersion, addiction and isolation, most of which may be significantly alleviated through smart design in terms of duration, agency, onboarding and acclimatisation. The growth of VR presents new opportunities for storytellers inspired by playful, imaginative, immersive experiences and there’s no doubt about the medium’s potential for emotional engagement, with many industry voices talking up the capacity for ’empathy’ and ‘wow factor. But this is also a field full of unknowns; there are very few established design patterns to rely on, and some health experts have voiced concern about the effects of long-term use, specifically for kids. With that in mind, how do you adapt what you know about storytelling and interactivity to suit the unique context of VR? What design strategies are being employed to make sure children can benefit from the opportunities of this new medium? I was thrilled to moderate this session to discuss design challenges with creative experts Peter Caddock, Head of New Technologies, Studio Liddell, Resh Sidhu, Virtual Reality Creative Director, Framestore, Phil Stuart, Creative Director — Preloaded and Svetlana Dragayeva, CEO & Creator, Fountain Digital, who came together to look at some best examples in this burgeoning space, sharing their own challenges working with VR for children. It was evident that a constant and interesting crossover from all of the VR sessions at CMC were layered through every discussion from ethics and business to design-thinking in VR for kids and the first question arose from a core theory of ‘why? Why should this story be told in VR rather than any other medium? We also looked at how, with story at the centre, to merge narrative design, experience design and emotional design in suitable, relevant and credible ways for children along with determining best practices in onboarding children and their parents, walking them through the 360 experience. Interactive storytelling tools are baked into the creation and design of a great VR experience with theories coming from architecture, psychology, behaviourism, storytelling, sound design and beyond. Considerations that were discussed prior to, during and after the session include factors ranging from genre & pacing, timing & duration, spatial awareness, environmental & physical space (ontological design) adding to the story and experience, sound & light triggers, experience & emotional design, engagement & hurdles, designing relevant stakes in the story to nurture a physical and emotional engagement and managing the hurdle/reward ratio. There are clear design considerations that may help dilute or even remove some of the concerns around Virtual Reality and children, but we are thrilled and excited to be part of continued that further testing, creation and design in order to grasp a deeper understanding of how children feel and behave when presented with, engaging with and recalling their VR experiences. This session ran in partnership with our VR workshop Open To Virtual that will be featured as part of this series. In preparation for expansion of this free puzzler mobile game, Seriously plan to launch a series of animated shorts to introduce the world of Minutia and its population of cute, courageous and fiendish inhabitants to the world. A Pixar-esque storyworld, Best Fiends is the first in a series of games, telling the story of the unlikely heroes' epic journey, and their battle against the Slugs of Mount Boom. Concepting stories for this hapless slugs and heroic fiends to develop into a series of shorts was a task that we have been delighted to dig into. With their first short 'Best Fiends Boot Camp' selected for the LA Shorts Film Festival, the glorious world of Minutia, along with Seriously, are one to watch. This 60 minute roundtable & micro workshop welcomes participants to a fun, interactive session for an essential overview on the fundamentals of immersive storytelling, coupled with best (and potentially worst!) practices for experiential storytelling in a 360/VR environment. Short case-studies of existing VR stories and experiences will be discussed and analysed from the perspective of experience design and story, and we will take a well known children’s fairytale to workshop as adaptation, remix or even a single scene, specifically and solely as a 360/VR story. This fun session will go beyond, and even dare we say bypass, the claims of VR as an ‘empathy machine’, and we’ll take a look at how story is now more important than ever before, how to use the medium of VR to it’s optimum (isolation, immersion, forced perspective, sound triggers and more), and which kinds of stories might just be perfect for an enhanced experience within a VR headset. We’ll forget the technology – that will catch up and is moving at an impressive rate – and we’ll forget the bells and whistles of VR as we take a look at the fundamentals of story to amplify and enhance experience design, the use of genre and pacing to immerse an audience, and the pillars of what makes storytelling in VR a reality. In preparation for global brand extension of this long-standing toy company, we worked with extensive market research material provided by Schleich to create storyworld, mythology, character profiles and story arcs that will extend across publishing and TV animation series. As part of a global brand alignment project, storycentral was commissioned to help reintroduce the Forevermark brand to its employees through story, rather than simple Brand Book..
We worked collaboratively with Forevermark to interview key figures that were pivotal and insightful to the birth of Forevermark in 2008 and went on to author and produce a hardback brand story – expressing the spirit, tone of voice and history of Forevermark. The book has been distributed globally to Forevermark employees. BY BAFTA WINNER & BORGEN CO-CREATOR ADAM PRICE. with its 1st European broadcast partner, DR.
to be shot in Denmark and Spain and is a co-production with French-German television station ARTE and SAM le Français, in association with STUDIOCANAL. in the Fall of 2017 with a second season scheduled for Fall 2018.
storycentralLABS have partnered with Danish broadcaster DR for a 1-day rapid prototyping/Digital Story Challenge at ConTech Academy, as part of the Festival de Television in Monte Carlo on 14th June 2016. 12 successful participants were selected from a short-list of applications and will be forming 3 high-impact teams that represent a diverse skillset that crosses digital media, storytelling, experience design and community building. Rides Upon The Storm centres on a family of priests in the Church of Denmark. The story is inspired by the myth of Cain and Abel and leads will be played by Lars Mikkelsen (House of Cards) and Ann Eleonora Jørgensen (The Kiling) in the roles of the parents while Simon Sears (Follow the Money) and Morten Hee Andersen will play their two adult sons. The 12 successful participants, carefully selected by storycentralLABS CCO & Founder, Alison Norrington, will come to Monte Carlo from around Europe – Italy, Norway, Denmark, Sweden and France to work to a very clear brief set by storycentralLABS and the Cross Media Manager of Culture at DR, Kåre Poulsen. Following the format of previous storycentralLABS with US partners Sundance TV, CBS Interactive and London Film School, the brief will remain a tight secret until the lab doors are closed at 9:30am on Tuesday 14th June but the 12 participants will be receiving show assets prior to their arrival in order to familiarize themselves with the story and characters. “At DR Fiction, we want to create TV dramas that are entertaining and thought provoking while astonishing the audience. We wish to ask audiences both the big and small questions, without giving away all the answers”. Following the model for Norrington’s previous and hugely successful storycentralLABS, two finalist teams will be invited to pitch on the stage at the Pitch Session & Prize Ceremony on Wednesday 15th June where a final winning team will be awarded a cash prize, but also the opportunity for ongoing discussions with the DR Fiction team about developing their idea further as a collaboration. storycentralLABS are welcoming back long-term friend and mentor Brian Seth Hurst who has been a key mentor in every storycentralLAB to date, along with new mentors John Heinsen, Annika Gustafson and Lorenzo Benedetti along with key members of the DR Fiction team who will make sure that teams creative strategies don’t compromise the integrity of the shows storyline and are feasible within the confines of a DR vision and strategy. Alison Norrington’s storycentralLABS is built on a long-standing modular framework that has been successful worldwide and begins with story at the centre and spirals out to consider factors such as how genre affects behaviour, experiential components, a balance between digital and analogue, levels of immersion, barriers to entry, interaction and participation right through to platforms, formats and community building. Dark Detour is a Halloween horror anthology series told in real-time through social media and more.